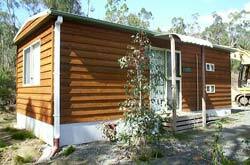 Hobart Bush Cabins offer comfortable accomodation for up to 6 people, in one queen and four bunk beds. Fully self contained, with cooking facilities, and ensuite, the cabins are the perfect family holiday location. Linen is provided.